Looking for the best Texas Weekend Getaway? Jefferson has plenty of fun and or romantic events for the weekend of Jan. 6-8, 2012. 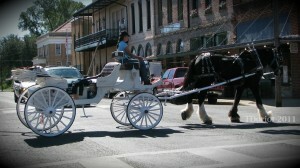 A romantic carriage ride awaits you! Thursday, January 6: “Dwayne Bettis Country Revue” (Country) @ 6:00 p.m.-9:00 p.m.
Friday, January 7: Karaoke @ 8:30 p.m.-12:30 p.m.
Saturday, January 8: “The Casey Martin Band” (Classic Rock) @ 9:00 p.m.-1:00 a.m. HISTORIC JEFFERSON GHOSTWALK Meet at the Corner of Austin & Vale St.
SINGLETON’S VIRGINIA CROSS HISTORIC HOME TOUR 401 Soda St.
Saturday, January 7 @ 1:00 p.m.
Saturday, January 7 @ 2:00 p.m. Sunday, January 8 @ 11:00 a.m.
Saturday @ 10:00 a.m., 12:00 noon, 2:00 p.m., 4:00 p.m. This entry was posted in Weekend Getaways by Tammy D. Bookmark the permalink.